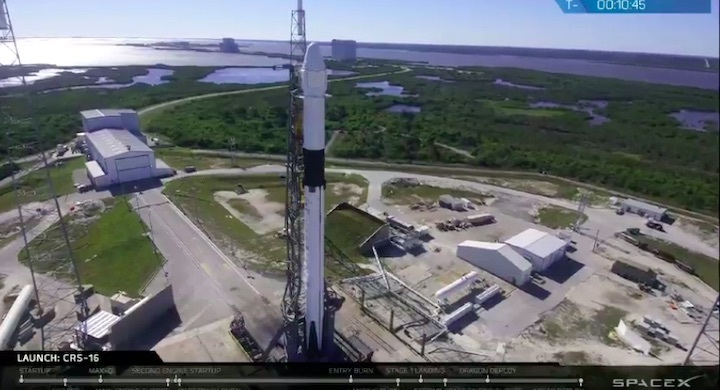 SpaceX will launch a Falcon 9 rocket launching the un-manned Dragon Cargo capsule to resupply the International Space Station. 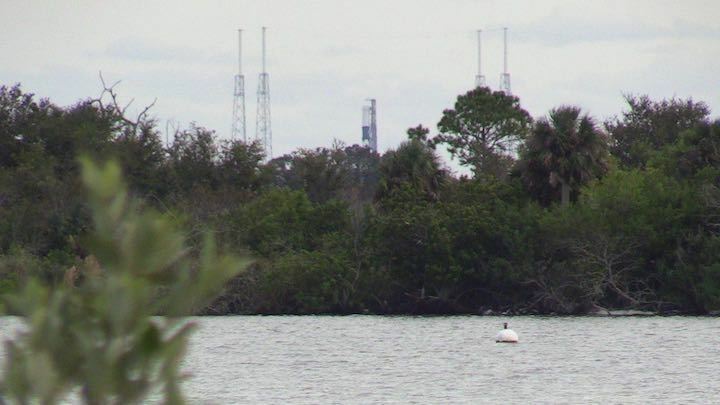 The Falcon 9 rocket will launch from Launch Complex 40 at Cape Canaveral Air Force Station and the first stage booster is expected to return to land at LZ-1 also at Cape Canaveral AFS. A two-stage SpaceX Falcon 9 launch vehicle lifts off from Space Launch Complex 40 at Cape Canaveral Air Force Station in Florida on June 29, 2018. SpaceX is targeting 1:38 p.m. EST Tuesday, Dec. 4, for the launch of its 16th resupply mission to the International Space Station. NASA commercial cargo provider SpaceX is targeting 1:38 p.m. EST Tuesday, Dec. 4, for the launch of its 16th resupply mission to the International Space Station. Live coverage will begin on NASA Television and the agency’s website Monday, Dec. 3, with prelaunch events. The Dragon spacecraft will carry supplies and payloads, including critical materials to directly support dozens of the more than 250 science and research investigations that will worked by the space station’s Expeditions 57 and 58 crews. 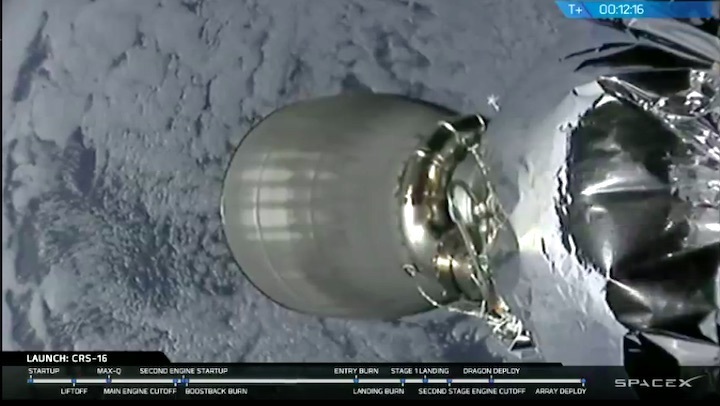 Among the research it will bring to station, the Dragon’s unpressurized trunk is carrying the Robotic Refueling Mission-3 (RRM3) and the Global Ecosystem Dynamics Investigation (GEDI). RRM3 demonstrates the storage and transfer of cryogenic fluid, which is critical for propulsion and life support systems in space. While the Robotic Refueling Mission Phase 2 (RRM2) demonstrated tasks leading up to coolant replenishment, the actual transfer of cryogenic fluid in orbit will be carried out for the first time with RRM3, using liquid methane. GEDI will make high-quality laser ranging observations of Earth’s forests and topography required to advance the understanding of important carbon and water cycling processes, biodiversity and habitat. Mounted on the Japanese Experiment Module's Exposed Facility, GEDI will provide the first high-resolution observations of forest vertical structure at a global scale. 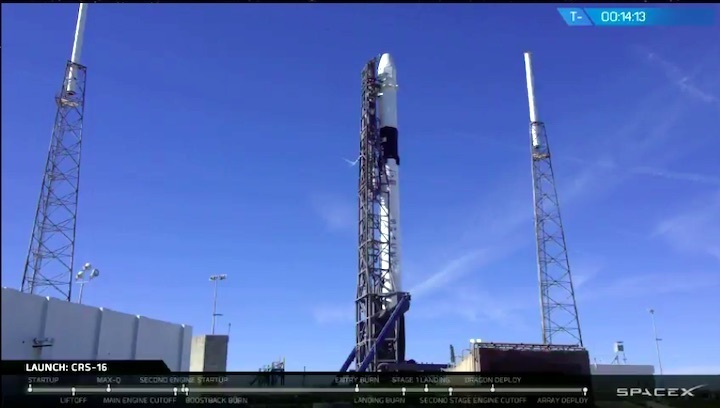 Dragon will reach its preliminary orbit about 10 minutes after launch. It will then deploy its solar arrays and begin a carefully choreographed series of thruster firings to reach the orbiting laboratory two days later on Thursday, Dec. 6. When it arrives, Expedition 57 Commander Alexander Gerst of ESA (European Space Agency) and Flight Engineer Serena Auñón-Chancellor of NASA will grapple Dragon. Anne McClain of NASA will assist the duo by monitoring telemetry during Dragon’s approach. After Dragon’s capture, ground controllers will send commands from mission control in Houston for the station’s arm to rotate and install the spacecraft on the bottom of the station’s Harmony module. Jill McGuire, project manager, NASA’s Goddard Space Flight Center in Greenbelt, Maryland, will discuss RRM3. The two-stage Falcon 9 launcher test-fired at pad 40 Friday night is set to blast off Tuesday at 1:38 p.m. EST (1838 GMT) with an automated Dragon supply ship heading to the space station. The Dragon cargo craft will haul several tons of supplies and experiments to the station, including NASA-funded payloads to be affixed outside the research complex to study Earth’s forests and demonstrate in-orbit satellite refueling techniques. A weather forecast issued by the U.S. Air Force’s 45th Weather Squadron at nearby Patrick Air Force Base suggests rain showers, thunderstorms and clouds might be a problem for Tuesday’s instantaneous launch opportunity. There is a 60 percent probability that weather conditions at Cape Canaveral will prevent liftoff, with the major concerns involving the thick cloud, cumulus cloud, and flight through precipitation launch rules. A backup launch opportunity is available Wednesday. SpaceX’s launch team loaded kerosene and liquid oxygen propellants into the Falcon 9 rocket Friday evening at pad 40, ran the launcher through a mock countdown, then ignited the first stage’s nine Merlin 1D main engines for several seconds at 10:20 p.m. EST (0320 GMT Saturday), while hold-down restraints kept the vehicle firmly on the ground. Workers will lower the rocket horizontal, return it to SpaceX’s nearby hangar, and install the Dragon spacecraft on the launcher this weekend before rolling the fully-assembled vehicle back to the pad. 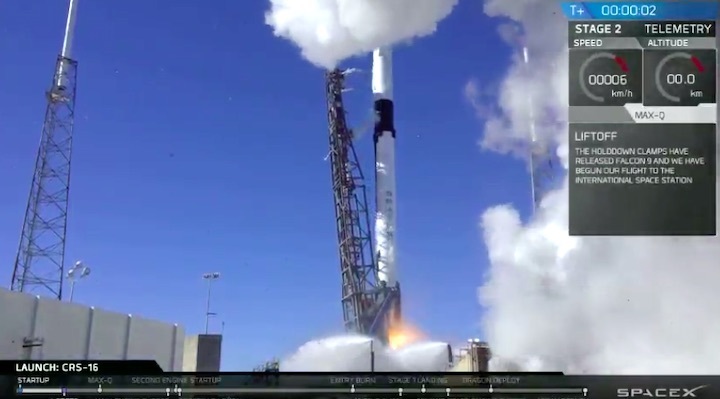 A hotfire attempt was apparently previously planned for Thursday night, but SpaceX aborted the engine firing and tried again Friday. 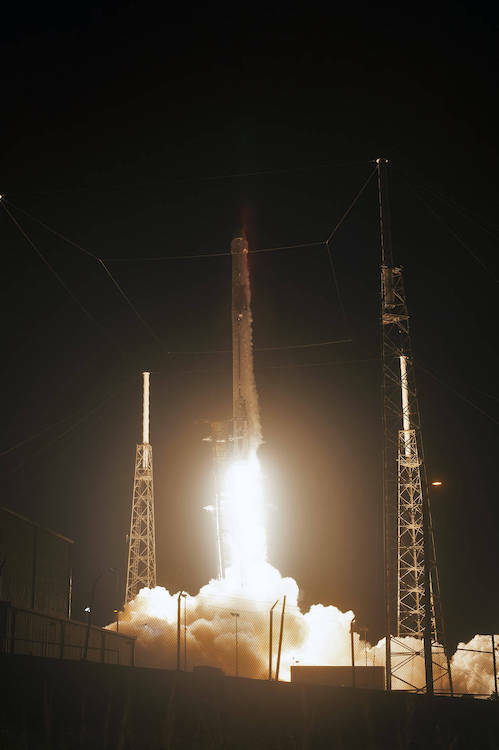 It will be SpaceX’s 16th resupply launch to the space station under a $3.04 billion NASA contract for 20 cargo transport flights through next year. 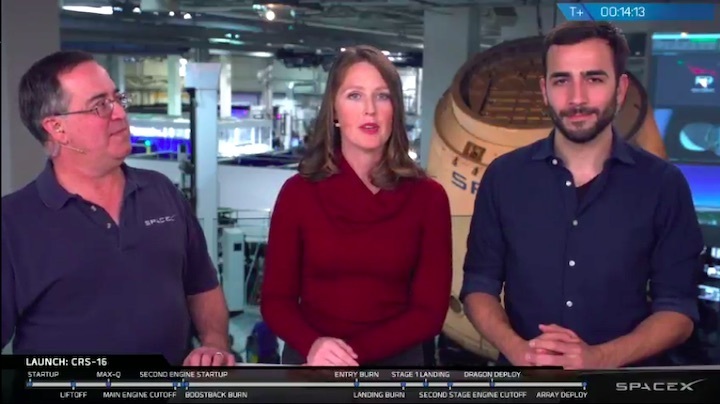 SpaceX and NASA have a follow-on deal for at least six additional cargo missions through 2024, plus a separate contract covering development and missions by SpaceX’s Crew Dragon spaceship for astronaut transport services. The Falcon 9 rocket set to lift off Tuesday, weather permitting, will fly with a new first stage booster. 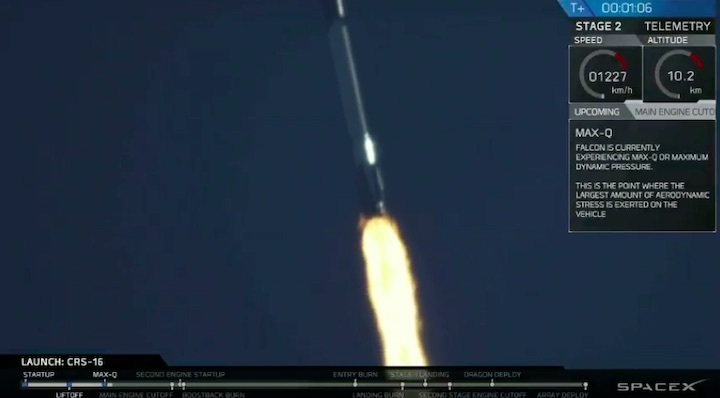 SpaceX plans to land the rocket at Landing Zone 1 at Cape Canaveral Air Force Station a few miles south of pad 40, the first such rocket return to Florida’s Space Coast since February. 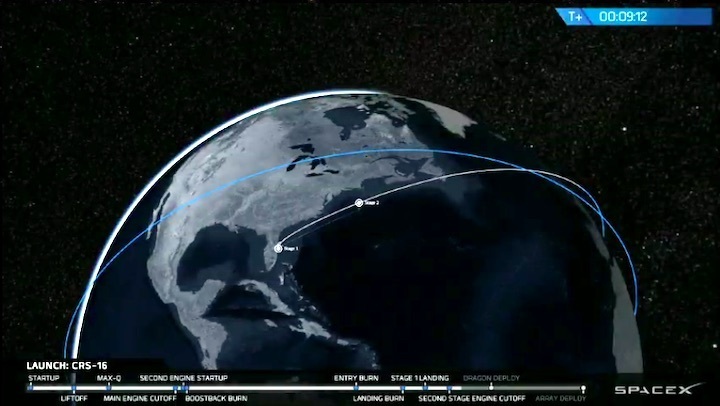 The Dragon capsule was recovered in March 2017 following a previous resupply flight to the station, then refurbished and outfitted for a second flight. Assuming an on-time launch Tuesday, the Dragon supply ship will reach the space station Thursday, Dec. 6, to begin a roughly one-month stay before departing and heading back to Earth for a parachute-assisted splashdown in the Pacific Ocean. Meanwhile, a SpaceX team at Vandenberg Air Force Base in California is preparing to launch a different Falcon 9 rocket Sunday at 10:31 a.m. PST (1:31 p.m. EST; 1831 GMT) on a commercial flight with 64 smallsats built and owned by companies, governments and institutions from 17 countries. The launch was set for Nov. 19, but SpaceX ordered a delay to conduct additional inspections, and the launch was further pushed back to wait for better weather. Sunday’s launch from California will set a record for the highest number of satellites ever launched on a U.S. rocket. 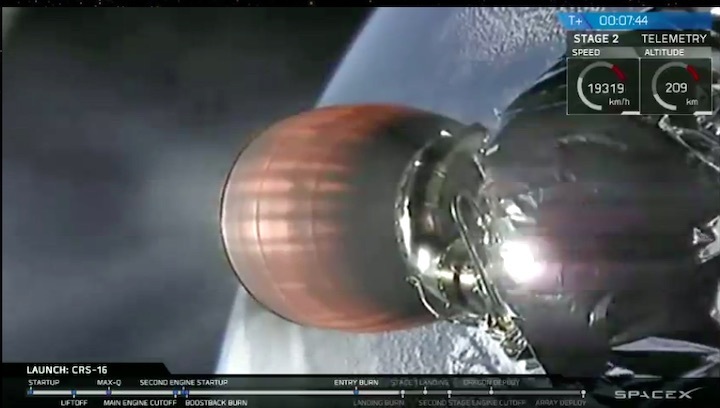 The rideshare mission, arranged by Seattle-based Spaceflight, will also mark the first time SpaceX has flown the same Falcon 9 first stage booster a third time. 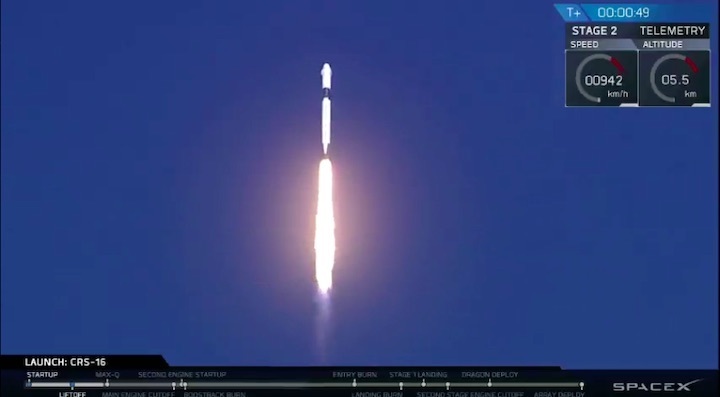 SpaceX has re-launched Falcon boosters 17 times since March 2017 — the fruits of a multi-year effort to recover the rockets and cut launch costs — but no Falcon 9 first stage has flown more than twice. That changes Sunday. Update, 11 p.m. Monday: SpaceX and NASA have decided to delay the Tuesday afternoon launch attempt. New launch time on Wednesday will be 1:16 p.m. ET. The outlook for Wednesday's SpaceX Falcon 9 launch from Cape Canaveral and post-liftoff booster landing looks excellent, according to local Air Force weather forecasters. 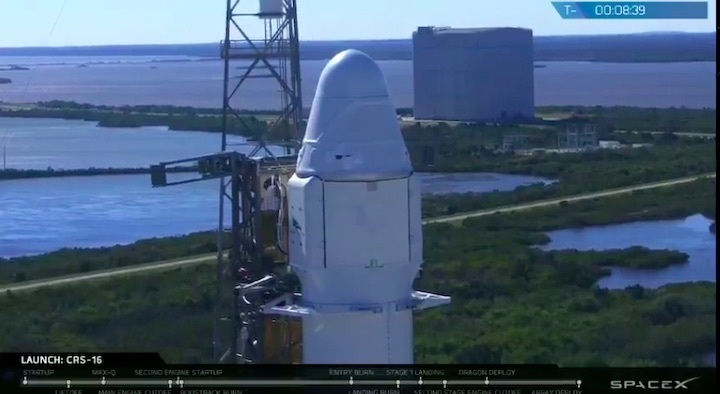 Conditions are expected to be 90 percent "go" for the 1:16 p.m. liftoff from Launch Complex 40, which will take a Dragon spacecraft packed with thousands of pounds of cargo to the International Space Station. "Virtually clear skies are expected by Wednesday morning," 45th Weather Squadron forecasters said in a Tuesday statement, noting that temperatures will also start dipping as a cold front moves into the area. The spaceport can expect a low of 57. 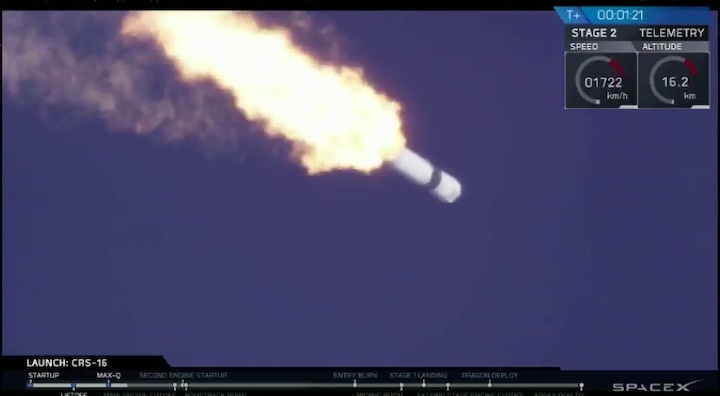 Local spectators should be prepared for the Falcon 9 booster's signature triple sonic boom as it approaches Landing Zone 1 about eight minutes after liftoff. The 156-foot-tall booster – 162 feet with landing legs deployed – is brand new. Spectators should also remember that roads leading into the spaceport will be blocked off beginning at 9 a.m. to alleviate congestion. Only employees, badged visitors and Kennedy Space Center Visitor Complex guests will be allowed through on state roads 3 and 405, which are the primary arteries into KSC. A robotic SpaceX Dragon spacecraft approaches the International Space Station on April 4, 2018 after launch from Cape Canaveral. When the Visitor Complex reaches capacity, guests will be turned around and only employees and badged visitors will be allowed through to the spaceport. Those traveling to Playalinda Beach via the A. Max Brewer Bridge or State Road 3 in Volusia County should note that checks will also be in place there. Those roadways into the beach will close when it hits capacity or at noon, whichever comes first. Wednesday's launch, SpaceX's 16th under NASA's Commercial Resupply Services contract, was delayed from Tuesday due to the discovery of contaminants in rodent food. CRS missions typically fly mice to the ISS for research purposes, but officials found mold in their food early Monday, forcing teams to fly replacements in from California overnight. After its arrival at the ISS, Dragon will spend about a month there before targeting a Pacific Ocean splashdown in mid-January. 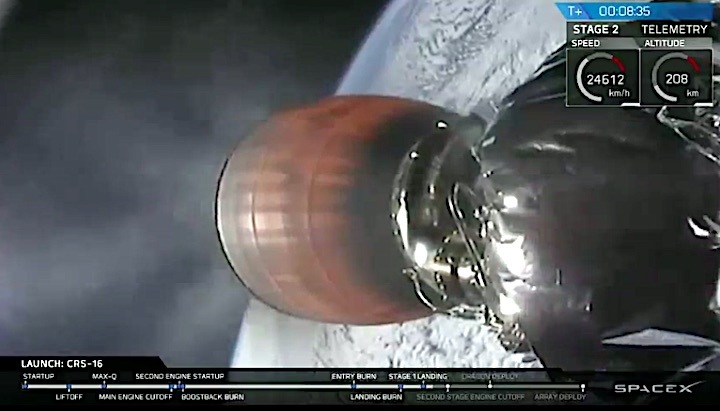 As a SpaceX Falcon 9 rocket flew back to Earth on Wednesday afternoon, an onboard camera offered stunning views of Cape Canaveral, its intended landing site, coming into focus. 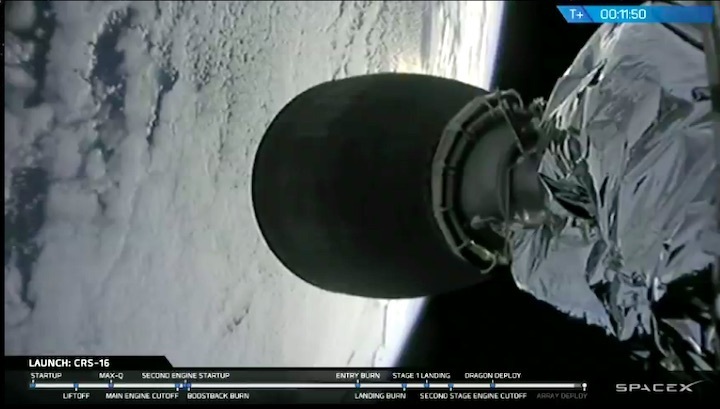 But when that view suddenly began spinning sharply from side to side and then cut out, as the 156-foot rocket stage dropped at the speed of sound, it was clear that something was amiss. 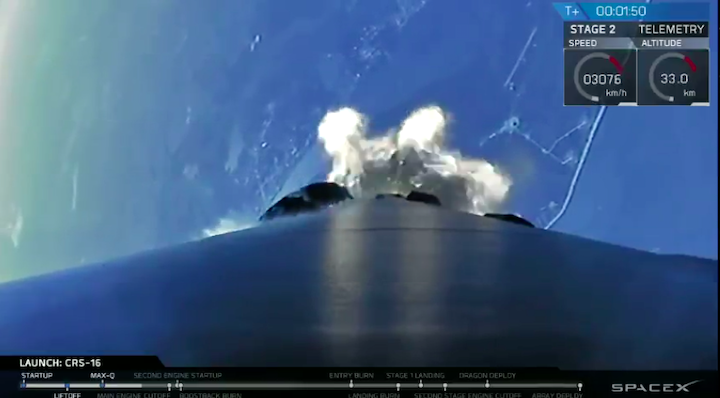 Eight minutes after its successful 1:16 p.m. blastoff from the same coastline, the booster fell short of its targeted touchdown at Cape Canaveral Air Force Station and splashed down in the Atlantic Ocean instead. SpaceX said the errant landing never threatened the public. 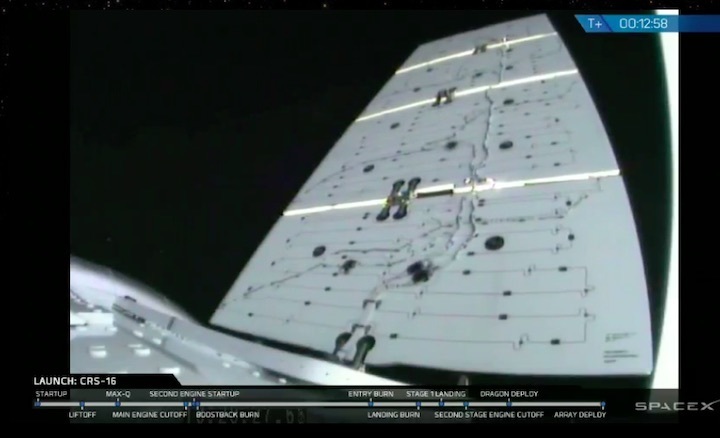 The unplanned water landing did not mar a flawless launch of a SpaceX Dragon cargo craft to the International Space Station, where it is due to arrive around 6 a.m. Saturday. The Dragon is packed with nearly 6,000 pounds of supplies, science experiments and food, including turkey, candied yams and other traditional holiday provisions. 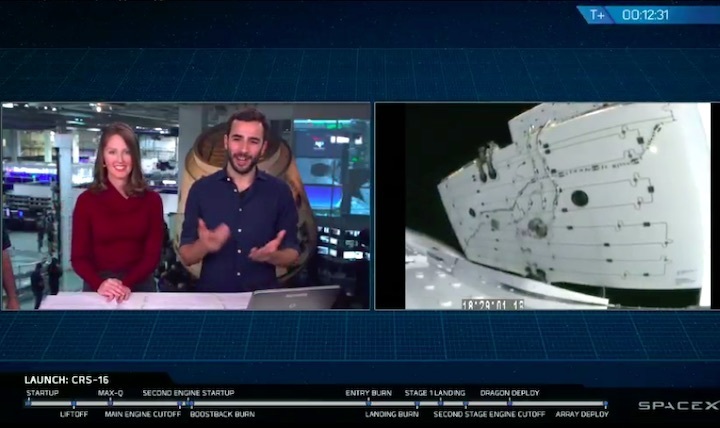 “The Dragon vehicle is performing nominally, and we have a 100 percent clean spacecraft on its way to the International Space Station and the six crew members on board,” said Joel Montalbano, deputy manager of NASA’s space station program. 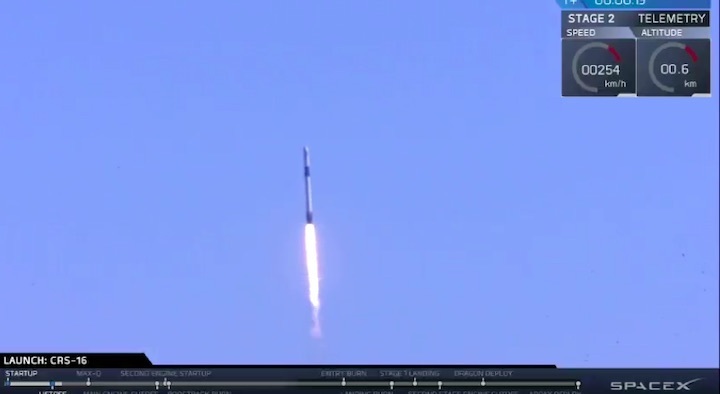 The launch was SpaceX’s 20th of the year, adding to a company-best total set two days earlier with a launch of more than 60 small satellites from California. 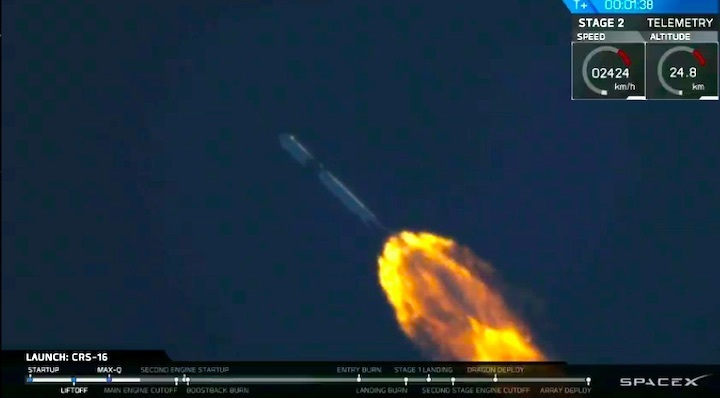 The landing would have been the 33rd by a Falcon booster — roughly half the number that have launched — and the first on land at the Cape since February, when a pair of boosters from SpaceX’s first Falcon Heavy launch touched down in tandem. Instead, it became the first missed land landing, after 11 successes. 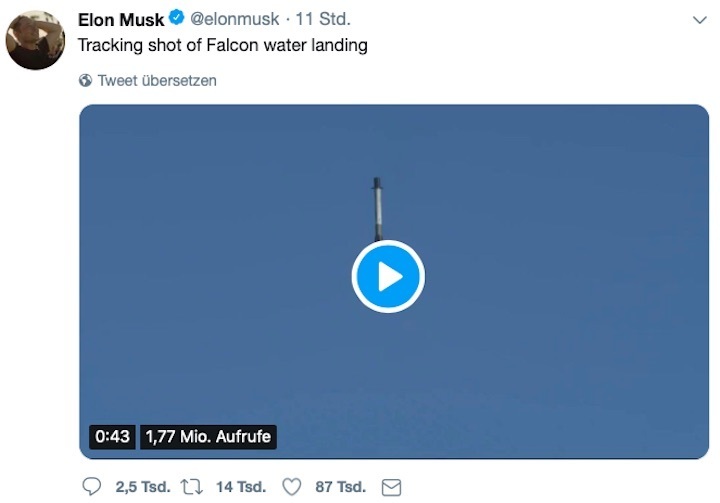 Despite appearing to spin out of control momentarily, the rocket still managed to hit the water softly with four legs deployed, and remained intact after tipping over. 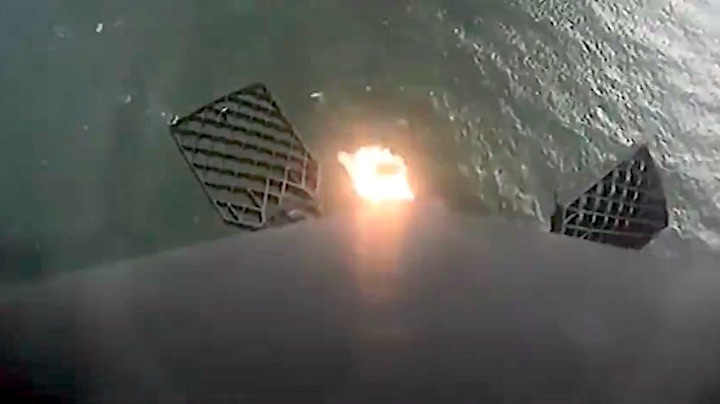 As a single engine was set to fire and slam on the brakes prior to a touchdown at SpaceX’s Landing Zone 1, the company believes the four grid fins that help control the booster’s descent malfunctioned. A hydraulic pump that steers the fins stalled, Musk said. 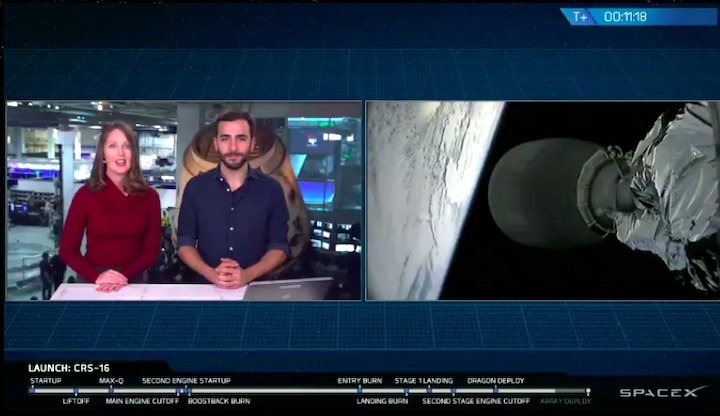 The system has no backup, but SpaceX will now consider adding one. 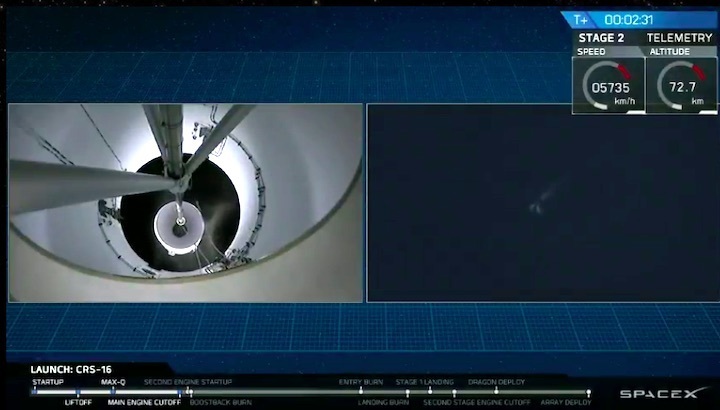 Falcon boosters are equipped with an automated self-destruct system that would blow up the rocket if it veered too far off course during a launch or landing. However, Koenigsmann said that system wasn’t needed because the rocket remained well within its intended flight path. 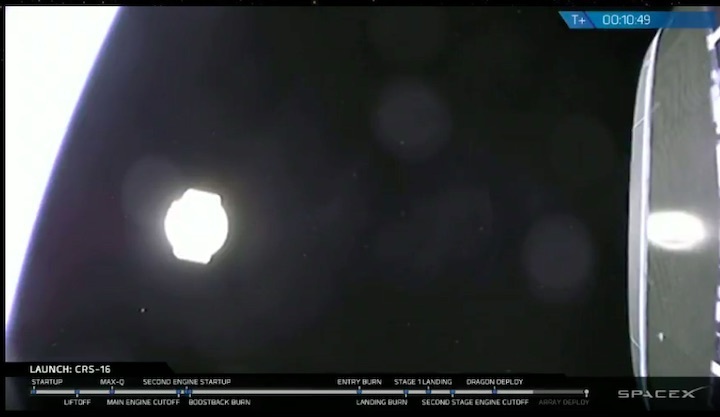 Instead, he said, the landing was guided by onboard software that targets an “impact point” through the final engine burn, known as the landing burn. 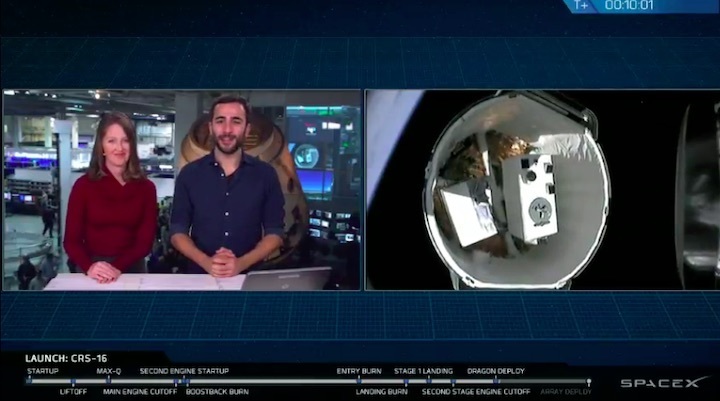 If all is well after that burn, computers move the target from a point in the water to the landing pad. But if something is wrong, they keep aiming for water. 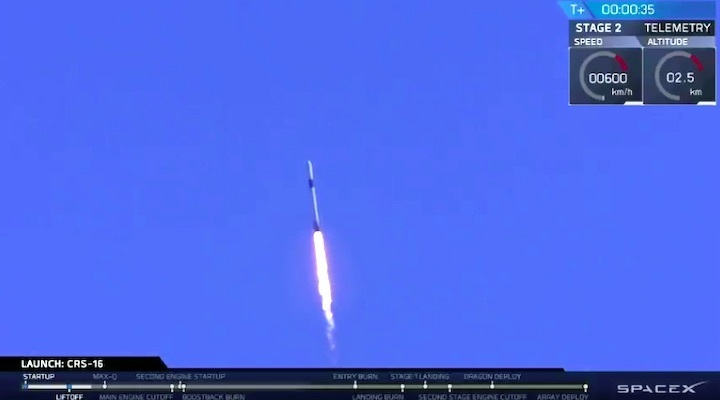 In this case the booster, which had dropped from a peak altitude of about 84 miles and top speed of over 4,000 mph, splashed down about two miles offshore. Some spectators still heard the landing's anticipated sonic booms, though they were not as loud. SpaceX planned to tow the booster back to Port Canaveral for inspections. Musk said it might fly again for “an internal SpaceX mission,” if it has not suffered too much from the impact or salt water intrusion. As a precaution, NASA and the Air Force's 45th Space Wing, which manages the Eastern Range and is responsible for public safety during launches, routinely evacuate portions of the Cape for any rocket flight and for Falcon landings. Koenigsmann said the landing problem probably would not delay upcoming missions, including the company's first launch of a Global Positioning System satellite for the Air Force, targeted for Dec. 18 from Cape Canaveral. No landing will be attempted during that mission. 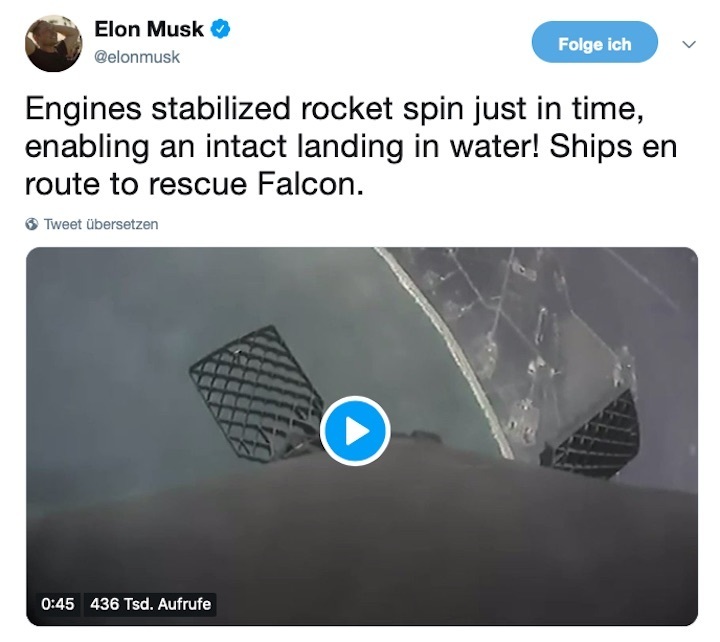 “As much as we are disappointed in this missed landing — or landing in the water, rather, instead of land — it shows the system overall knows how to recover from certain malfunctions,” he said.